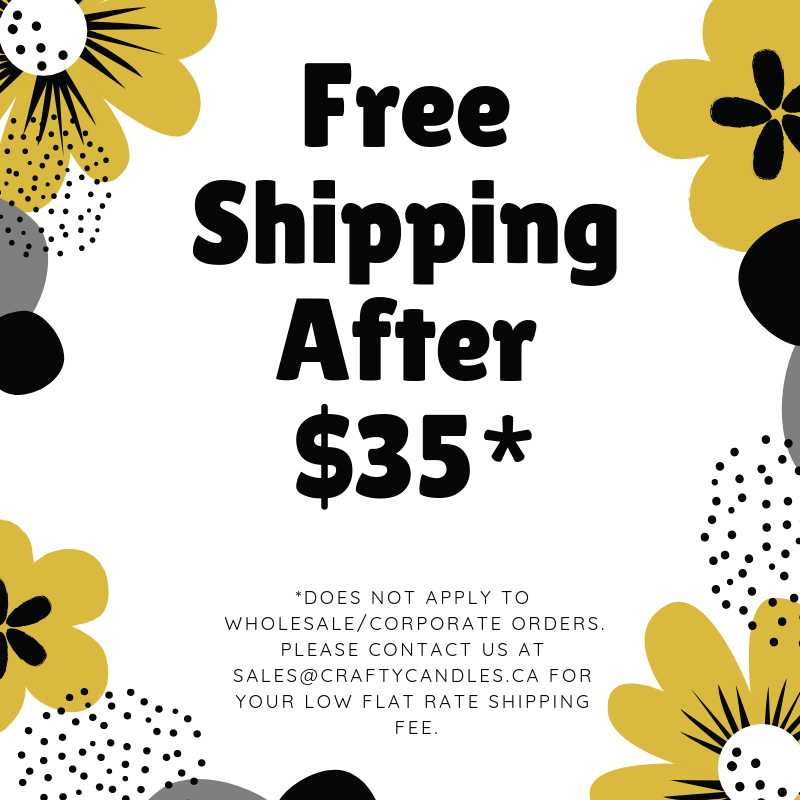 Crafty Candles is the largest handcrafted candle factory in Windsor – Essex County. The scents listed here are considered best sellers with the quantity to fulfill large volume orders. If we still have the scent, we can make any of our products with it. Just let us know what you’re looking for! Tan Smells like applesauce, the way grandma used to make it! Tan and purple A yummy berry crisp with a delicious crumble top. Deep Red A mixture of black cherry and the sweetness of Merlot. White 400 count Egyptian sheets. Tan Warm maple syrup drizzled over pancakes! Multicolour & Multilayered This candle is made with that last little bit of wax we have in our pour pot. You'll never know what scent will be next as it burns from layer to layer, however you can be sure they will be fabulous and strong! Red and tan A sweet blend of caramel, apples and cheesecake. Bright red Mom accidentally poured a whole bunch of cinnamon over your small bowl berries. Who knew it would smell so good? Dark tan Nothing better than the smell of warm, gooey, icing-topped, stick-to-your-fingers-when-you-tear-them-apart, straight out of the over cinnamon buns! Rich rusty red Rust coloured cinnamon sticks freshly grated and ready to top on your favourite dessert. Orange A wonderful creamy orange scent, like an orange vanilla Popsicle. White and bright red Fresh coconut with a hint of strawberry. Pale baby blue Playing hide and seek among mom’s freshly hung, line-dried sheets. Divine! Rust orange Warm cinnamon, apple, pumpkin, nutmeg – All the best autumn baking smells! Deep red with brown crumble on top Spicy cranberry with a hint of brown sugar. Burgendy/Moss Green Sweet and tart, exactly like the taste of rhubarb with some berry and earthy notes. Aqua green and light peach The clean smell of green cucumbers and crisp pink muskmelon. A very refreshing scent with a touch of sweetness. Brown Just like a hot cup of joe with cream and sugar. Ivory One of our most popular scents! Scent is reminiscent of vanilla extract. Butterscotch A very yeasty smell, this scent will make your guests think you've been baking bread all day! Rich yellow Citrus and peaches and melons all mixed together in a bright yellow bowl ready for eating. Dark brown Our top seller! The warm, spicy, sweet goodness of a kitchen where everything is made with love. Rich red/brown Grandma’s fresh baked apple pie. Warm brown/orange A remarkable replica of the deliciously sweet, coffee tinged chocolate bar. Periwinkle A relaxing light purple candle perfect for unwinding after a stressful day. Melon/Orchid Purple Fresh flower blend of Lilac and Tulip, with notes of green that keep it refreshing! Beautiful scent, not an overpowering floral. Bubble Gum Pink Love Spell is a fragrance from the Victoria's Secret Secret Garden collection. A lavishly lush combination of peach, cherry blossom and white jasmine make it perfect for your enjoyment. Aqua Green A light floral scent with hints of a running brook. Rich red/purple) Our signature in-house blend of berries and fragrance that is packed full of scent that is ripe for the smelling! Tart and sweet, and very strong! Dark beige and brown Exactly like a fresh baked loaf of raisin bread. Sage green and soft yellow A robust clean smell of just picked sage and newly squeezed oranges. Warm sand/beige An inviting woody scent that will calm your mind. Ocean blue The fresh salty wind coming off the ocean and into your cabana! Navy Blue Just as the name implies, it is sure to calm and relax even the most stressed! Black Musky and sultry, this scent is a cologne that leads a woman to day dream of things best left to romance novels! White Top/Beige Bottom Our most popular coffee scent. A mix of coffee beans with a touch of vanilla and notes of cinnamon. Bright red Homemade strawberry jam. Deep red The best pie combo in the world! Tangy rhubarb and sweet succulent strawberries. Soooo good! Light sage green The subtle sweet smell of long blowing grasses on the prairie. Ivory with tan crumble on top Reminiscent of white cake with sprinkles just like your 8th birthday cake! Ivory with cinnamon to top Our creamy French vanilla scent with a touch of cinnamon. Butterscotch Baking apples, cinnamon and pastry all rolled into one.